When I got Witching Hour's latest from Hells Headbangers with a genre label of "blackened thrash", I figured I knew what I was going to get: More of the Venom worship most of Hells' bands are best known for. 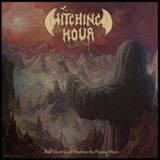 Nor had Witching Hour's previous LPS ever contradicted my initial impression, one in which dirt, leather, and bullet belts predominated. But that is no longer the case; the band has updated its sound, and ...And Silent Grief Shadows the Passing Moon (Silent Grief from here on out) is a lot colder and lonelier -- and a lot more interesting. The rough-hewn production is still present, but Silent Grief's songwriting is a lot more detailed. Mournful, minor-key riffs uncoiling from the band's duelling guitars counterpoint old-school bass riffs. A lot of timing and riff experiments are happening at once here, and sometimes the band drops some of the balls they're trying to juggle; they take on an ambitious program and are so eager to try so many different things that their musical patterns and time signatures change jarringly, apparently to unsettle the listener (it succeeds), or possibly just due to a short studio time on a low budget. But the resulting mix of thrash, black metal, and NWOBHM merge together in a frozen concoction that combines some of the best attributes of all three genres: Cold riffing and retro songwriting layered on top of high-speed thrash beats. Sorrow Blinds His Ghastly Eyes is one of the best of these mixes, but the moody As I Walk Among Sepulchral Ruins (I love the names they give these tracks) is also excellent, with more of their previous d-beat-filled ripping than other tracks. I especially like the rising riff, backed by an organ, that they do about a quarter of the way through. Witching Hour's two vocalists have also modified their singing styles to fit their newfound sound, substituting despairing howls for their previous raspy grunts. Past Midnight... proved that their technical abilities as musicians were good, and gave a few hints of their predilections for NWOBHM, but Silent Grief reveals a new atmosphere they've never brought to their music before. This is really good.